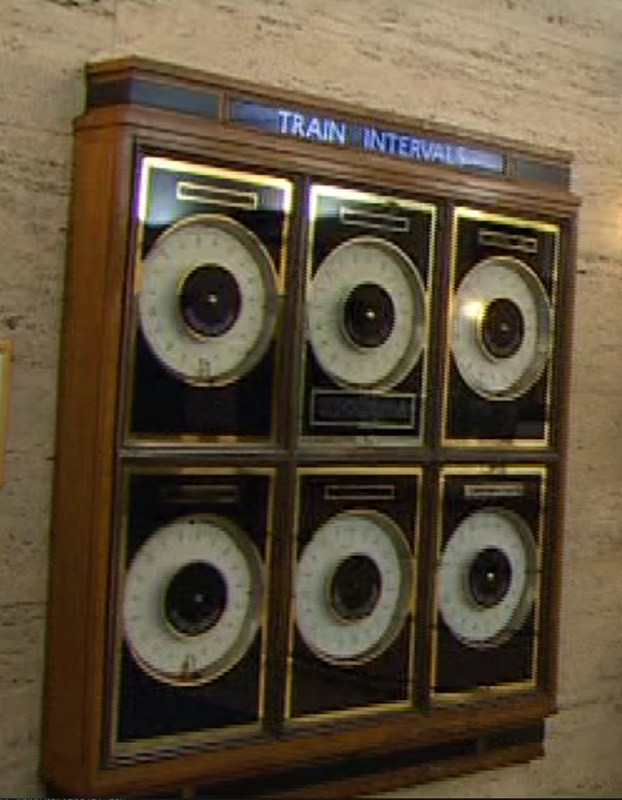 These 24 hour train indicator dials are apparently still to be found in the entrance lobby of the headquarters of the London Underground, at 55 Broadway. They featured in David Heathcote’s TV program looking at London’s 1920s Art Deco heritage, shown recently on on BBC 4. 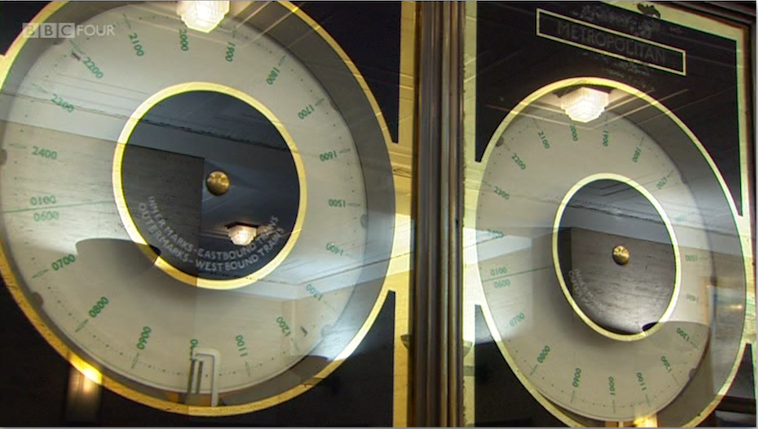 There’s a separate indicator for each of six main lines running when the building was first opened. It’s possible that one of them is still running today. Each dial starts at 0600 and runs until 0100, passing through 2400 on the way, and appear to rotate clockwise, past an indicator at the bottom. How they actually indicate the trains is not clear —if anyone knows, please tell us! Sir,– I note that on Wednesday next Lord Newton is to move in the House of Lords for the adoption of the 24-hour clock recommended by the Home Office Committee as far back as 1919. To the general inconvenience, we still proceed to reckon time, not by days, but by half-days. This is, perhaps, forced upon our attention most in railway time- tables, for railways run continuously round and round the clock, and in international broadcasting programmes where all times of the day become one time. The Underground day, although it has defined limits, is odd, starting about 5 a.m. and closing about 1 a.m., some 20 hours later. Numerous devices of type and symbol are employed for distinguishing anti- and post-meridional time, but they are often uncertain and sometimes clumsy. It would therefore be a gain if the convention of the 24-hour clock, covering the entire day, were commonly adopted so that 2.30 a.m. would be plain 2.30 and 2.30 p.m. would become 14.30. On the Underground Railways we should be prepared to make the ￼change. Certainly the transit of the sun across the meridian has no visible significance underground. For one, however, to change is only a gesture, and has its awkward reactions. If all who use time for time-tables were to change, then we should have rationalized one further detail of living. ￼Sir,–I note the Astronomer Royal’s letter in The Times of December 2. As it happens, the London Passenger Transport Board has to consider the reprinting of its time-tables for its railway and coach services, and the problem of distinguishing between a.m. and p.m. once more arises. It seems strange that there should be any reluctance to adopt a proposal which has been found necessary in all those spheres of activity in which exactitude is essential. I therefore once more urge that we should now adopt a common practice in this matter. Once it is adopted and made a common practice,no more, I am sure, will be heard in criticism of it. More details of how Britain tried and failed to adopt the 24 hour clock can be found in the ebook: Counting Time. There was a point on each Underground line where a passing train would send a electrical pulse to the train interval recoding devices. 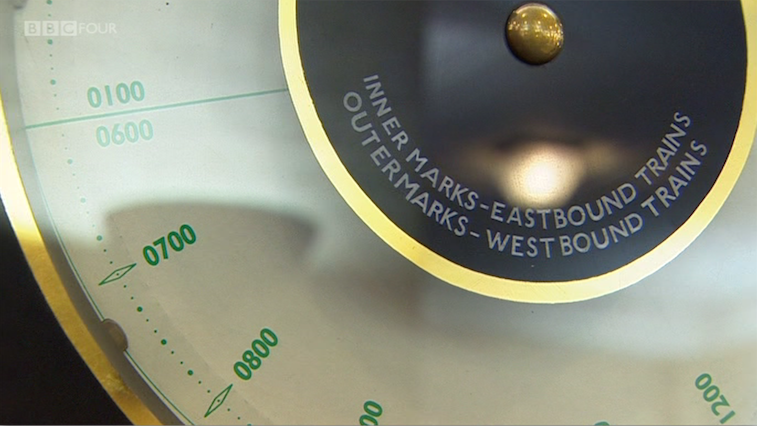 That would cause an ink mark to be stamped on the rotating paper disc. Each disc had two concentric arcs of marks, one for each direction. I don’t know where on each line the signal was sent from. At the end of the day the discs were collected and passed to the appropriate section of the headquarters building above to be checked to see that appropriate time intervals had been maintained (and if complaints been received during the day no doubt a minion could be sent to the ground floor to check the discs). If the interval recording discs were just for operational purposes they would logically have been in the appropriate office, but – essentially for good publicity – they were installed on the ground in what was then a public circulating area, not a private reception space, so all passers-by could see whether the Underground was working correctly and maintaining the intended service. A similar set of discs was installed in the Piccadilly Circus station circulating area.